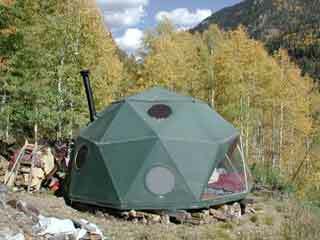 Thermoshield insulative paint camouflages this green 16′ Dome, at 9,200 feet in the Colorado Rockies. 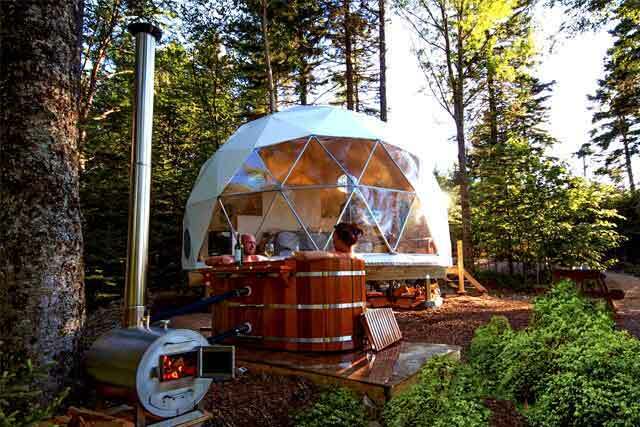 White Thermoshield sprayed on the inside, reflects the wood heat back into the dome. Some non stick masking tape and thin plastic sheeting (enough to mask your bay window) An airless sprayer, with 2500 psi that pumps one gallon per minute and has an atomizing pressure fan spread of 60 degrees, with a nozzle with a tip orifice of 0.031 inches. Please note: sprayers with these specifications are not available from all rental companies. It may be necessary to hire a professional with the appropriate equipment. Tell them that Thermoshield is an elastomeric paint and inform them of these sprayer requirements. Acceptable equipment includes; Binks Super Hornet, Graco 433 or larger. *Brushes or rollers will also work, but will not be as even for light transmition. We do not recommend rolling or brushing on Thermoshield because you will see uneven strokes when light shines through the dome skin. Apply Thermoshield paint on a dry and preferably sunny day, 50° F or warmer. 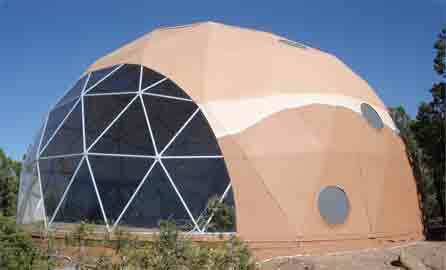 It is preferable to paint your dome while it is clean and new. If your dome is dirty, clean it using a power nozzle and/or a mild soap solution and a scrub brush. Remove all mildew. Clean the window pockets well. Allow fabric to dry thoroughly before applying Thermoshield. Tape off the bay window with plastic sheeting. Use tape that will peel off easily. Remove the round windows, cover them with plastic sheeting, and reinsert. Close all zippers. Make sure that no zippers or Velcro are exposed to paint. Remove ALL screens and filters from the sprayer and the nozzle. The ceramic bubbles in Thermoshield are a key component of the paint, and may get caught in fine filters and clog the sprayer. Prime pump with water before attempting to spray Thermo-Shield® Exterior Wall Coats. Practice your spray stroke testing the consistency of the sprayer on a peice of cardboard or scrap fabric. Apply thin, even coats, allowing each coat to dry to the touch before you apply the next coat, one to two hours. To assure adequate and uniform coverage, spray all coats in the same direction, do not cross spray to avoid showing undulations and other small imperfections in the walls. To paint the roof, open one of the corners of the roof. 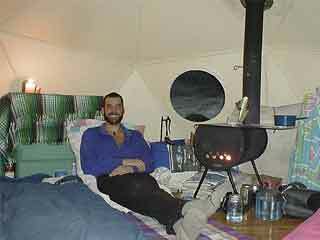 Put a ladder inside the dome below the open corner. Stand on the ladder with your upper body outside the dome. Paint as much of the roof as you can reach. Repeat through an adjacent corner until the whole roof is painted. Zip up the roof immediately after painting. Do not remove the roof to paint it with Thermoshield. The paint will shrink the fabric as it dries, making it very difficult to put the roof back on. Remove round windows. Separate the round window frames with toothpicks. Apply several thin coats inside the window frame, especially on the bottom where the drain hole is. This protects the fabric from any dirt that collects inside the window casing. Flip up the bottom of your dome and apply several thin coats to both sides of the bottom hem of your dome skin. This will protect the fabric from dirt. If Thermoshield gets on the vinyl window remove with a wet cloth. If it is dry, remove it with alcohol or Goof Off. Thermoshield will quickly dry to touch in warm weather but will take a couple days to fully cure. Thermosheild paint is recommended in areas with extreme UV. It will reflect the 99% of the UV off the dome, keeping the dome cooler and extending the life of the fabric. Orienting the bay window away from the sun, or using a Pacific Domes curtain will prevent heat build up through the clear vinyl. Attaching the curtain to the exterior will protect the clear vinyl window from UV exposure as well. 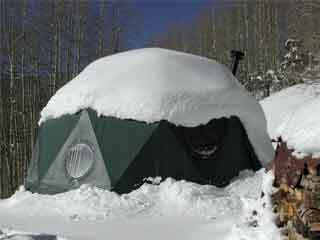 Thermoshield will change the esthetics of your dome. Pacific Domes is not responsible for the outcome.